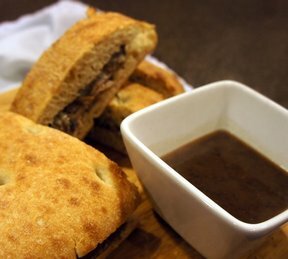 Despite the name, the French Dip Sandwich did not originate in France. 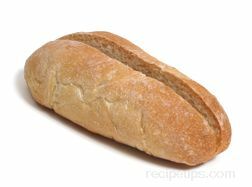 The name comes from the type of bread that is used: a French roll or baguette. The sandwich actually originated in the United States, specifically in Los Angeles, in the early part of the twentieth century. Two restaurants, Philippe the Original and Cole’s P. E. Buffet, claim to have invented the sandwich. At Philippe the Original, the story goes that Philippe accidentally dropped the sandwich into a pan of meat juices, but the patron for whom he was preparing the sandwich offered to eat it anyway. The customer liked it so much that the word spread and soon everyone was ordering the dipped sandwich served on a French baguette, hence the name, French Dip. The sandwich is still served pre-dipped at Philippe’s and Cole’s, but at most other restaurants in the country it is not pre-dipped, so it is accompanied by a bowl of meat juices. 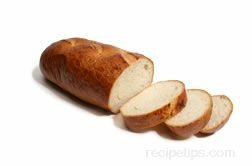 Since there really is not much to a French Dip Sandwich other than beef slices, French bread, and meat juices (cheese is an option at some restaurants, as well as spicy mustard or horseradish sauce), the secret for preparing a top notch version is to use the best ingredients. The sandwich will taste best and be easier to eat if tender, top quality beef cuts are used. Beef cuts from the rib or loin are desirable, but cuts from the chuck, round, or brisket can also be used if they are of the best quality or have been braised to tenderize the meat. Leftover oven roasts or pot roasts are good candidates for French Dip sandwiches. In order to be a true French Dip Sandwich, the bread used must be a type of French bread. It must be a fairly dense, crusty variety to withstand the abuse it receives from repeated dipping into the meat juices. This is why a French baguette or pistolet roll are most often used. 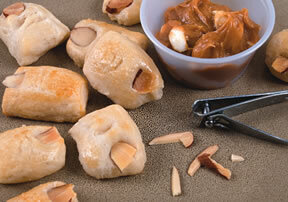 Softer breads and rolls should not be used because they will disintegrate quickly. Perhaps the most important aspect that separates an ordinary French Dip from an extraordinary one, is the meat juices used for dipping. The best au jus is prepared with the meat juices that flow from the beef as it cooks. Canned dipping sauce or meat juices prepared from packaged mixes, although good, will not have the subtle nuances of flavor that real meat drippings can provide. 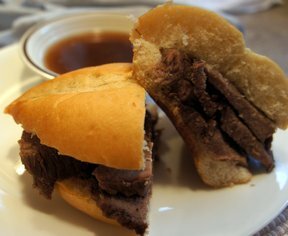 French Dip sandwiches have become a common menu item at a wide range of restaurants, sandwich shops, and fast food outlets. Not only is beef used, but lamb, pork, ham, and even turkey meat have become common meats that are served. 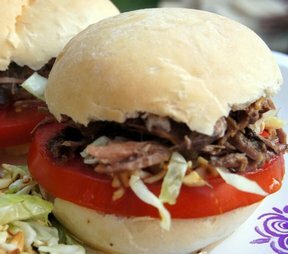 Regardless of the type of meat that is used, the same types of crusty French rolls that are used for the traditional beef French Dip are used for all of the other varieties. Shown below, are the components of a French Dip Sandwich.